Charter Yacht Tivoli, a 90-foot Doggers Bank expedition-style luxury motoryacht, has custom designed this sample New England private yacht charter itinerary touring the many art galleries and artist colonies along Maine's scenic seacoast. 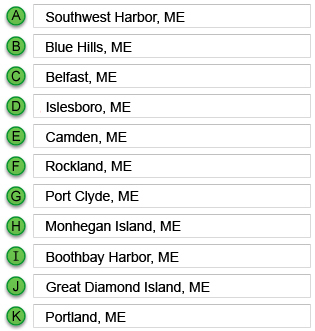 This Maine seacoast yacht itinerary travels 186 nautical miles over 8 days, averaging between 2-to-4 hours of travel per day. The longest voyage at 40 nm. Welcome aboard. Trevor, Caren, Joe and Captain John have everything prepared for your Noon arrival. As soon as you are situated, we begin. First stop, Blue Hills. Morning in Blue Hills. Visit the Blue Hills Bay Gallery. Depart at 1:00 pm for the four hour cruise aboard Yacht Tivoli to Belfast. After a morning in Belfast, it’s off to nearby Isleborough for a short visit before we turn towards our next destination, Rockland. Spend all day in Rockland & Camden visiting the Farnsworth Museum - Jamie Wyeth - Seven Deadly Sins and the Eric Hopkins Gallery and the Robert Indiana Gallery. Enjoy the sights along the Maine coastline as we travel two hours south through the Muscle Ridge Channel to Port Clyde and the real, authentic-Maine Port Clyde General Store. Visit Gallery by the Sea and the Morris Hill Gallery. Then, it’s off to the fabled artist colony located on Monhegan Island. Take in the Gleason Fine Art Gallery and the David Lee - Millenium Gallery during your morning visit to Boothbay Harbor. At 2:00 pm, we set course for Great Diamond Island, arriving at 6:00 pm where we will be on dock for the evening. There is a 5-star restaurant on Great Diamond should you wish a night out before arriving in Portland. A short final voyage brings us to the end of our Maine yacht cruise. The beauty and art of the many works seen all throughout Maine signature art galleries can only be surpassed by the grandeur and awestruck beauty of the actual Maine seacoast which drew the artists here in the first place. On this special trip, you get to enjoy both. During the summer and fall seasons, Tivoli is based out of Newport, Rhode Island and Rockland, Maine. You can contact us to create a custom luxury yacht charter itinerary to any of the points along the Connecticut/Long Island coastline, Newport, RI, Cape Cod, Nantucket & Martha’s Vineyard, Boston, Marblehead, the infinite inlets, harbors and islands along Maine’s craggy seacoast and even travel as far north as Montreal and Quebec along the St. Lawrence Seaway. How about a fall foliage cruise? 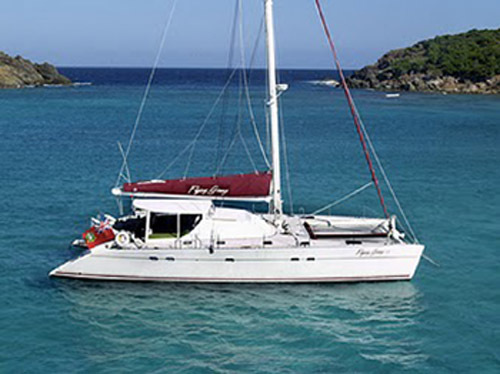 The charter yacht Flying Ginny VII, a 55-foot Lagoon catamaran, is offering $1000 OFF their standard yacht charter price for a Virgin Islands sailing vacation taking place between the dates of June 12 and July 6, 2012. This beautiful 55-foot Lagoon catamaran had a major refit in late 2011 when purchased by her new owner. Flying Ginny accommodates up to 8 guests in 4 cabins (3 Queen, 1 with twin upper/lower bunks) each with their own private ensuite electric head, sink and shower. She is spacious, beautifully redecorated and loaded with enough toys to keep even the most active charter guests busy and entertained. Special offer: $1000 discount off any 7-night charter taking place between June 12 and July 6, 2012. The charter yacht SINGLE STAR, offers fly-fishing and wildlife enthusiasts an ultimate Alaska adventure trip with their eco-tourism cruise. 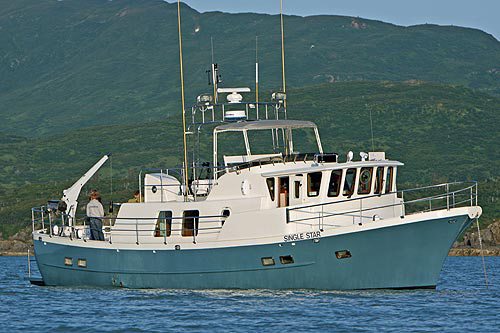 The charter vessel SINGLE STAR, a 58-foot trawler, is available out of Kodiak, Alaska. The boat accommodates up to four guests in two cabins, each with ensuite head/shower. For fishing, SINGLE STAR has an 18-foot fiberglass flats boat with 40HP motor. For fishermen, the area offers fabulous fishing of both Salmon and Halibut. The advantage of a fishing vacation aboard SINGLE STAR is that as fish move from stream to stream depending on water temperatures, the boat moves with them. Access to the remote rivers and estuaries is easy with SINGLE STAR's flats boat. Captain Lee Robins is a certified FFF instructor so whether you are a novice needing instructions or an old hand at fly fishing, you are sure to have the time of your life. For fisherman wishing to keep their catches, SINGLE STAR is equipped with a large deep freeze to keep the catch frozen until returning to port and packaging for shipment. For the wildlife enthusiast, SINGLE STAR offers professionally guided wildlife photography and eco-tours around Kodiak Island and the Katmai Coast. This area is famous for the amazing amount of wildlife, moderate temperatures and stunning scenery. Watch the sea otters, sea lions, seals, fox, rare waterfowl, ducks, humpback whales, killer whales, fin whales, bald eagles, coastal brown bears and fox. The month of May you’ll find the nesting sea birds hatching. Your professional guide will lead shore side hikes to pristine wilderness sites for up close and spectacular photography opportunities. Video: Learn more about Single Star's Alaska Adventure Eco-Tourism Cruises. Airport pickup and delivery to MV Single Star, daily guided shore excursions, all meals (served family style), USCG licensed Captain, all National Wildlife Refuge permit fees, private us of entire yacht. Not included are alcoholic beverages, fuel (figure 35 gallons per day of charter) and fishing licenses. $12,500 for 1-4 guests in 2 staterooms. $17,500 for 1-4 guests in 2 staterooms. 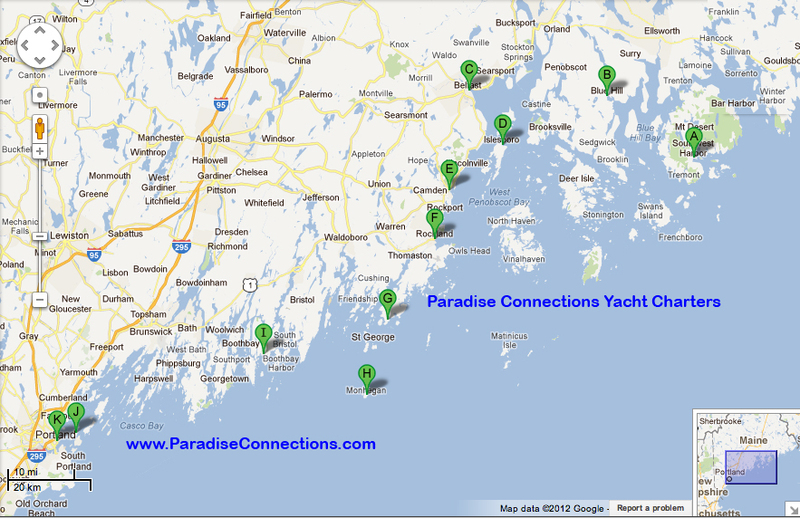 Available for summer charters in New England! 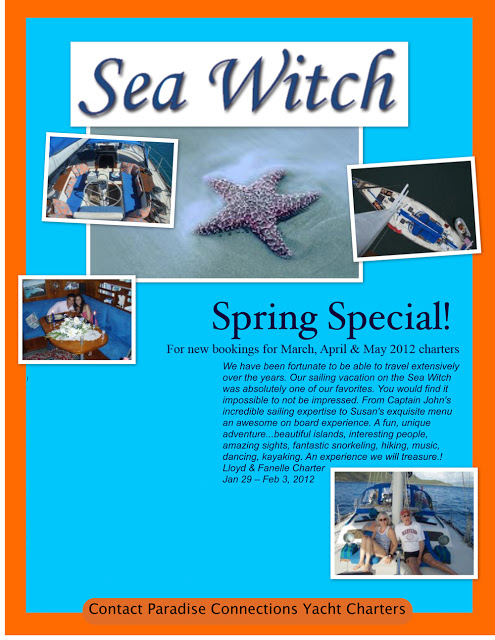 Sea Witch is offering a Spring Special for new (as from March 7th) bookings for all-inclusive, Caribbean yacht charters taking place in March, April, and May 2012. Sea Witch will be departing the Virgin Islands mid-May and heading North! 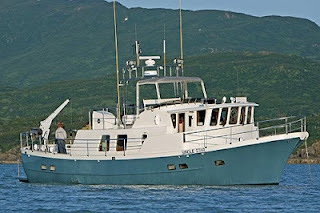 They will be available for New England charters beginning in June and running into October. Then it will be time for them to begin their journey back to the Caribbean.